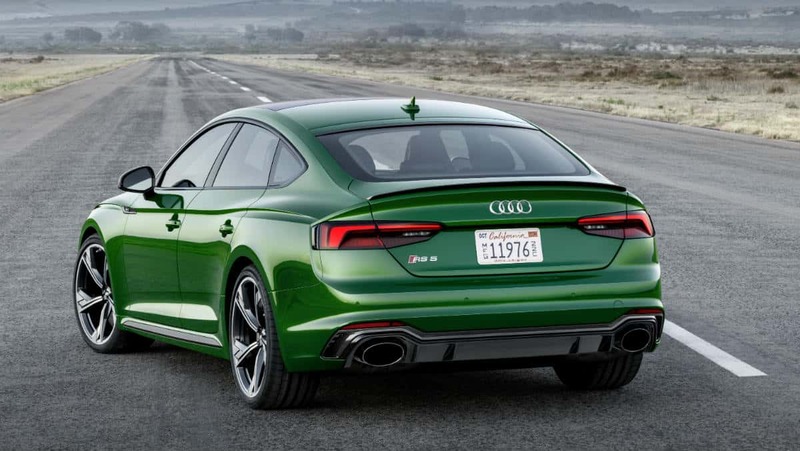 The new Audi RS 5 Sportback – excellent design and optimum performance. 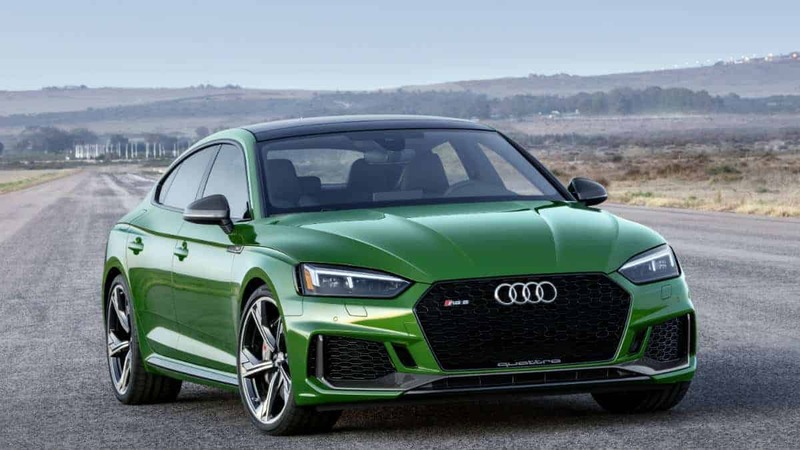 Audi Sport launched an innovative high-performance model onto the market, it combines stirring design and a high level of everyday usability with superior performance. 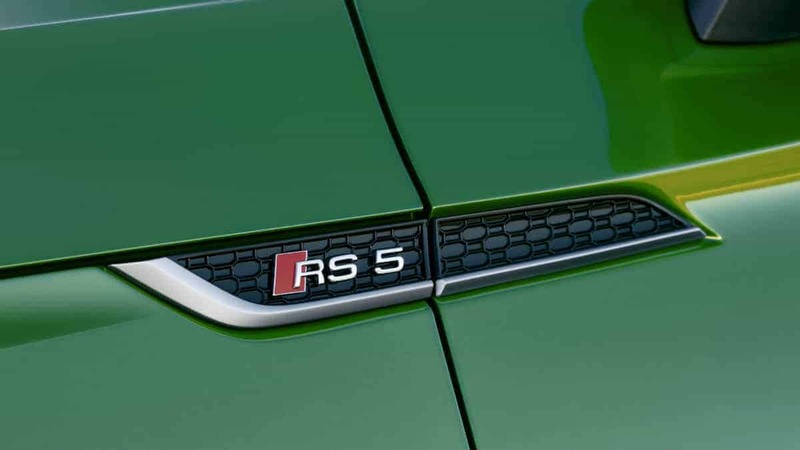 The exterior design of the new Audi RS 5 Sportback combines stirring curves and taut, athletic surfaces. The longer wheelbase, short overhangs and long, wraparound engine hood with power dome all emphasize the dynamism of the model. The characteristic wavy shape of the powerful shoulder line is a visual highlight of the high-performance coupé. When viewed at an angle from behind, the modeled sides look particularly impressive. Here, Quattro blisters emphasize the strong bulges over the wheel housings, which have been extended by 15 millimeters (0.6 in). 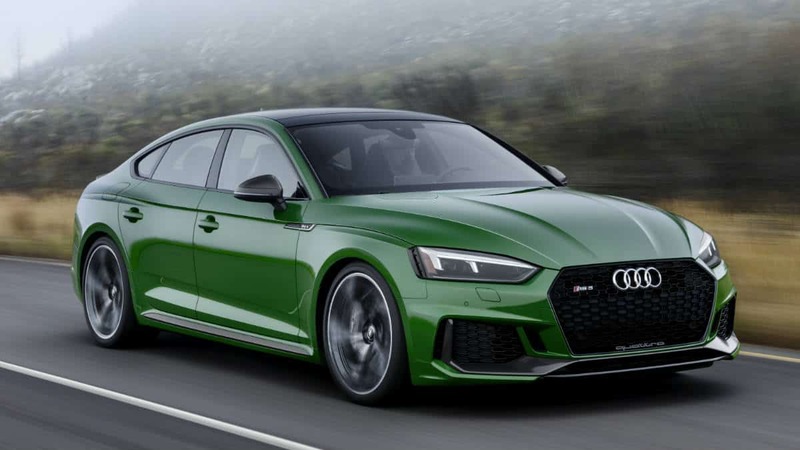 At the front, the Audi RS 5 Sportback features a wide, flat single-frame grille, solid air intakes with a honeycomb structure typical of an RS, and a front spoiler with matte aluminum Quattro lettering. Aside from the headlamps, the vehicle features additional design elements in gloss black, making the RS 5 Sportback appear even wider. An RS-specific diffuser insert, RS exhaust system with oval tailpipes and fixed spoiler lip give the rear end its sportiness. 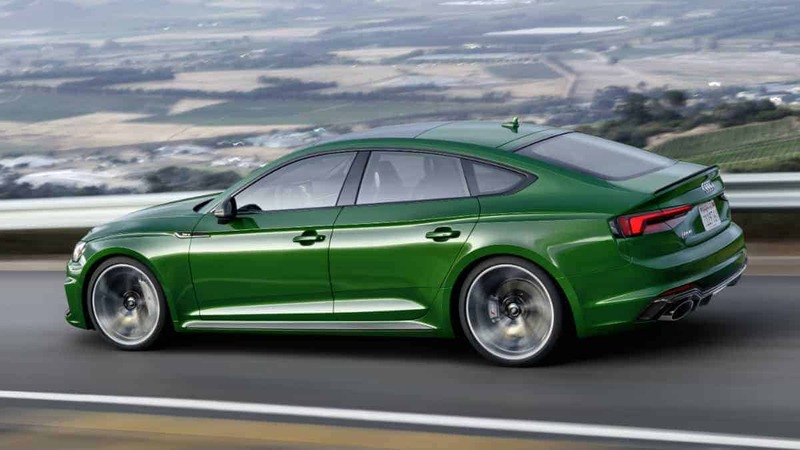 The RS 5 Sportback comes with 19-inch wheels as standard; 20-inch wheels are available as an optional extra. The new Audi RS 5 Sportback can be customized with the Gloss Black, Carbon, and Matte Aluminum optic packages. The 2.9 TFSI V6 twin turbo engine offers both power and efficiency and can achieve 331 kW. Its maximum torque of 600 Nm is deployed throughout a wide speed range from 1,900 to 5,000 rpm. The Audi RS 5 Sportback accelerates from 0 to 60 mph in 3.9 seconds, with the possibility of reaching a top speed of 174 mph. The two turbochargers of the 2.9 TFSI V6 twin turbo generate up to 1.5 bar of charge pressure. As with all new Audi V6 and V8 engines, the turbochargers are mounted at a 90-degree angle to the cylinder banks, which means that the exhaust side of the cylinder heads is inside, and the intake side is outside. This layout enables a compact design and short fuel paths with minimal flow loss – the 2.9 TFSI engine reacts extremely spontaneously to the movements of the right pedal. The B-cycle combustion process with central direct injection contributes to the overall efficiency. The power of the 2.9 TFSI is transferred to the Quattro permanent all-wheel drive with center differential via an eight-speed tiptronic transmission with optimized shift times that is specially tuned to sporty driving. It distributes power asymmetrically 40:60 between the axles – this guarantees dynamic handling with optimal traction alongside the greatest possible safety. When slippage occurs on an axle, most of the power immediately flows to the other axle – up to 70% to the front, and up to 85% to the rear. This locking effect enables a clearly-defined torque distribution and precise cooperation with the control systems. The optional sport differential selectively shifts the torque between the rear wheels. The five-link design on the front and rear axles allow for substantially enhanced comfort, even in the sportiest of driving modes. 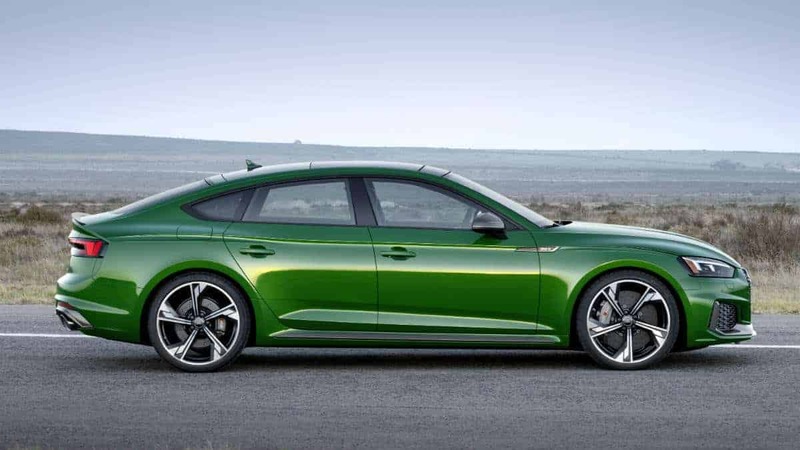 With the standard RS sports suspension, the RS 5 Sportback is seven millimeters (0.3 in) lower than the Audi S5 Sportback. Alternatively, Audi Sport offers RS sport suspension plus with Dynamic Ride Control (DRC), ceramic brakes and RS-specific dynamic steering. Drivers can create their own personal driving experience – to make it more customized, more dynamic or more comfortable – using the Audi drive select dynamic handling system, which is fitted as standard. The high-quality, sporty interior of the new Audi RS 5 Sportback is finished in black, and provides space for five people. Its square-shaped profile and loading width measuring exactly one meter (3.3 ft) enable optimum use of the 480 liter (17 cu ft) trunk capacity. Folding down the rear seats increases the capacity to 1,300 liters (46 cu ft). The rear seat backrest is divided in a 40:20:40 ratio as standard.